Disney's Newsies - Closing Night! Stop the presses! The much-anticipated Disney film (turned Tony-winning Broadway hit!) that inspires everyone to fight for what's right and to ‘seize the day’, is coming to the Starlight Mountain Theatre stage! Set in turn-of-the century New York City, NEWSIES! is the rousing tale of Jack Kelly, the charismatic leader of a band of teenaged newspaper boys - "newsies." When the titans of publishing raise distribution prices at the newsboys’ expense, Jack rallies newsies from across the city to strike against the unfair conditions and fight for what's right! Based on the 1992 motion picture, and inspired by a true story, NEWSIES! features a Tony Award-winning score by Alan Menken (Little Mermaid, Beauty and the Beast) and a book by Tony Award winner Harvey Fierstein. 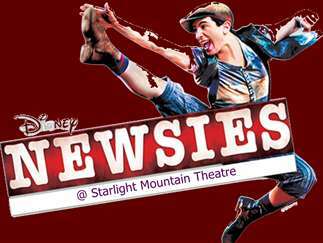 Featuring the now classic songs “Carrying the Banner,” “Seize the Day,” and “Santa Fe,” NEWSIES! is packed with non-stop thrills and a timeless message, perfect for the whole family. Get your tickets today!